Old Trafford, Manchester - Manchester United Blog: Who should play against Spurs? Apart from City at the Etihad next April, United's toughest looking remaining fixture is the trip to Tottenham on Sunday. Last year, the reds earned a hard fought point at White Hart Lane (click on image left for a reminder) on a day when it was United's defenders who were the heroes - Vidic in particular drawing praise. It was the second time in three seasons that the fixture ended scoreless but in the context of the title race it was a point gained for United rather than two dropped. This year, with City showing no sign of stopping, a point may not be enough. Indeed Paul Scholes claimed during the week that United may have to win all of their remaining games to win the title. If that is true, how should Sir Alex approach Sunday's game at White Hart Lane. When the reds travelled to Tottenham last January they were still unbeaten in the league but they did have a less than impressive away record, having won just twice on the road all season. This time 'round, the reds have been excellent on their travels. 9 wins, 3 draws and just 1 defeat so far have seen Fergie's men gain 30 points from a possible 39 away from home. So is this grounds for optimism? If it is then there is plenty more to go with it. Spurs have the worst record in head to head encounters between the top 5 and morale is low after a 5-2 hammering by Arsenal last weekend. Still, these psychological advantages are unlikely to make the game any easier. What is likely to have a bearing, on the other hand, is the absence of Scott Parker. Chart 1: The player influence chart from the fixture last season. Click image to enlarge. A quick glance at the chart shows a dominant Spurs with Modric in control. Out wide, Hutton and Assou-Ekotto saw plenty of the ball too; usually supplied by the excellent Modric. In fact, the top five passers, in order, were Modric, Assou-Ekotto, Hutton, Palacios and Darren Fletcher. The next United player in the list is Carrick in 8th place. Chart 2 shows Modric's passing in more detail. Much of the Croatian's passing was aimed toward the wings. With Lennon and Bale quiet, it was left to the full backs to get on the ball. Spurs managed 35 crosses in the match compared with United's 13. It is interesting to note however that the most advanced full back on either team was Rafael; this despite the fact that he had Gareth Bale to worry about. Elsewhere for United, Carrick played on the left of centre - not his best position - with Fletcher on the right. This was probably to provide Rafael and Nani with an extra pair of hard working legs as they sought to negate the threat of Bale. Largely, the ploy seems to have worked. Bale was limited to one shot and he created just one chance in the match. On the right, Aron Lennon hardly fared better against Evra, a player he usually enjoys playing against. We see from the player influence chart that Evra played slightly deeper than usual, perhaps to focus on his defensive work. What this meant ultimately is that United lacked width going forward as Giggs, on the left, was drawn infield in an attempt to counter the Spurs midfield dominance while Nani, on the right, drifted inside toward the box as he always does. 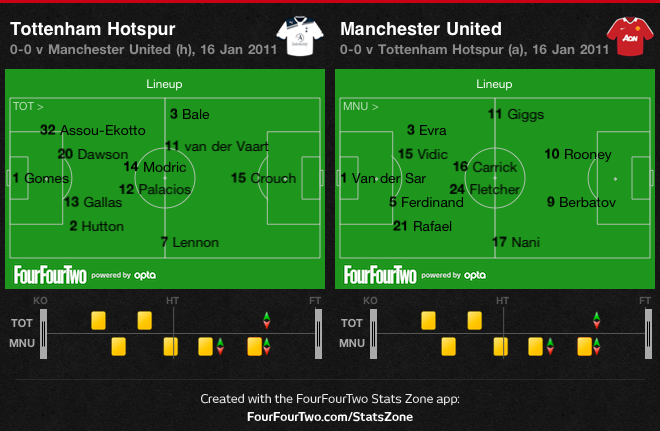 Chart 3: Player influence United V Spurs last August at OTmcr. In the home game back in August, United again played quiet narrow as we see in the chart above. Although Young did manage to get wider than Giggs had done at White Hart Lane, he is still drawn into quite central positions. As ever, Nani played along the box while Smalling and, to a lesser extent, Evra, maintained whatever width the reds could muster going forward. It seems as though Evra's deep position is a recurring theme against Aron Lennon and once again it seemes to have worked. Lennon saw almost none of the ball, completing fewer passes than David De Gea in the match. For Spurs, Assou-Ekotto was a key figure once more, as were Van Der Vaart and Kranjcar in midfield. Indeed Kranjcar saw more of the ball than any other player, completing 48 passes. For United the best was Anderson with 43. But these figures are a long way short of the passing stats we are seeing from the likes of Carrick this season and that may prove key on Sunday. There is little doubt therefore that Carrick will start Sunday's match (and will play a much bigger part than he manged last year). Likewise, Wayne Rooney (if fit), Rio Ferdinand, Patrice Evra, Jonny Evans and David De Gea will all start. But what will the rest of the team look like? The absences of Parker (suspended) and possibly Van Der Vaart will hamper Spurs, even if they have decent back up in Sandro, Kranjcar and Livermore. Still, United will fancy their chances of making a better show of it in midfield than they managed last time. At right back, Rafael's good record against Bale is likely to be in his favour. His sending off in this fixture last season was harsh and Fergie will surely give him the nod again. This leaves the left wing and the centre forward positions to be filled. In all of the big games this season, Sir Alex has gone for Welbeck. We reckon he will do so again while the left wing position is likely to be between Young, Giggs and Park. If Park is chosen he will offer United some extra cover in the middle as he naturally drifts inside to help his central midfielders. 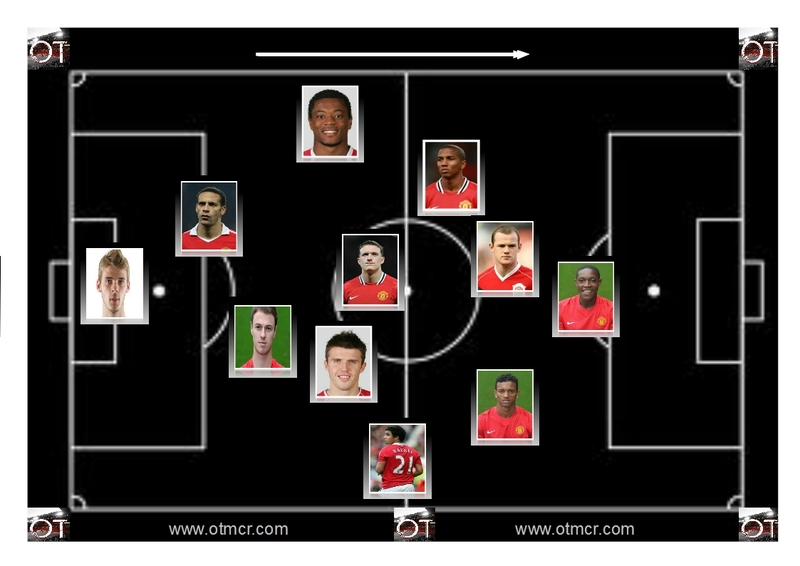 This would be a good defensive option but may be unnecessary if Jones plays central midfield. Last season Giggs played quiet a narrow role on the left, in spite of his natural leftward leanings. It restricted his attacking effectiveness but it was necessary as he helped hold back the tide as United dug in. Sir Alex may well decide to go for the Welshman again following his winning goal against Norwich last Sunday. But it is our feeling that Young will get the nod ahead of him. The former Aston Villa man has momentum having provided the cross that led to Giggs' last minute goal at Carrow road and he will provide good legs up and down the left channel should Evra need help. .....All of which leaves us with the following side and formation. Let's see if we're right again.